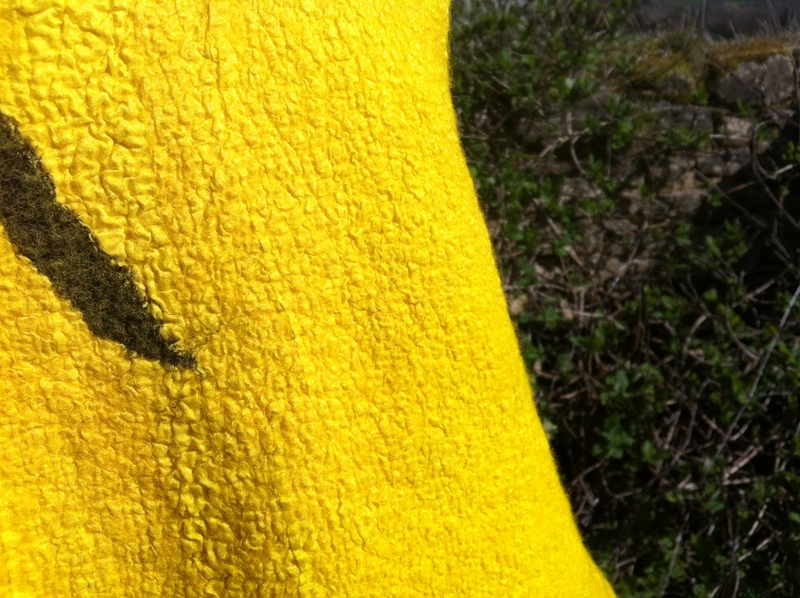 Personalised felting tools now available, HELP PLEASE and turmeric update!!! 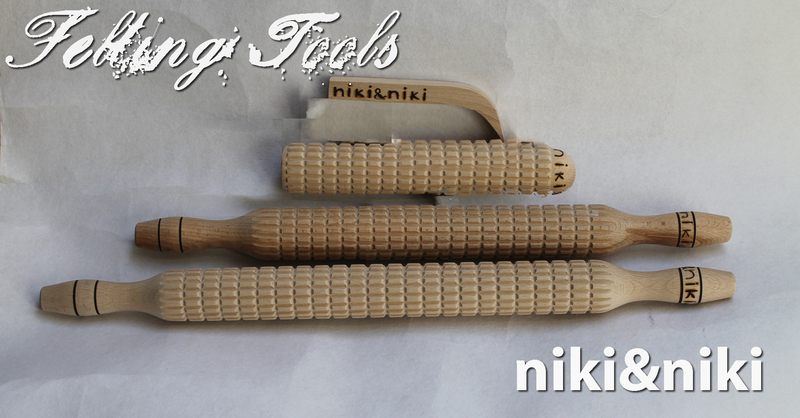 I’ve been attached to my computer since 7am this morning but I’m happy to say that the ‘niki & niki’ range of felting tools are finally available to buy online!!! Niki Collier and I are also really excited to offer an optional personalisation service whereby customers may have their own name (or maybe that of a friend!) 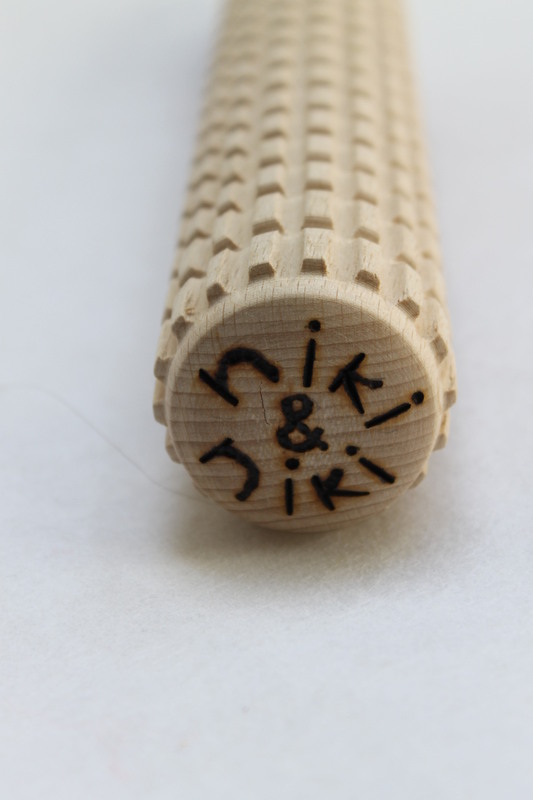 branded on any tool, this service will cost E6 per item and up to 10 digits (including spaces) may be inscribed. I always label my own tools with a marker when I head off on my travels so this strikes me as a perfect but much more stylish solution, now it will be easier to keep track of all my equipment on the go!!! The final names that we have selected for the tools are ‘The Big One’, ‘The Modest’, The Minimalist’, the ‘Mini Minimalist’ (all various lengths of rollers) and ‘The Prodder’ (shaper), thanks to everyone who had suggestions about naming the prodder!!! Head over to my Etsy store to see what we currently have in stock, I’m trying to add an ordering option for ‘The Prodder’ and ‘The Mini Minimalist’ because they’re already sold out, I was sure I should be able to do this on Etsy but maybe my brain is just too tired now! I’ll have another go again tomorrow but for now if you are interested in either of these tools email me and I’ll add you to the waiting list. I promise not to lose your details, see the next paragraph below! HELP PLEASE The internet connection has been horrendous today so it’s taken almost 12 hours to get there, in the meantime I’ve been getting messages via email and Facebook from interested felters and that’s where I’m calling out to you. Since I first blogged that the tools were almost ready to launch (just over a week ago) I wrote down pre-orders on a piece of paper, but where on earth has that bit of paper gone??? If I haven’t already emailed you a request for payment this afternoon via PayPal please email me immediately, followers of this blog will already know that I’m disasterous when it comes to paperwork, sorry but unfortunately that’s the truth so if you want your order posted on Monday I will need your details again please. I did think that all the ‘prodders’ were already ordered but now I can’t remember all the names so apologies, Kim you may be in luck yet! Anyway, thanks in advance to anyone who does contact me again, I’m really sorry about this but I can’t do anything other than ask. 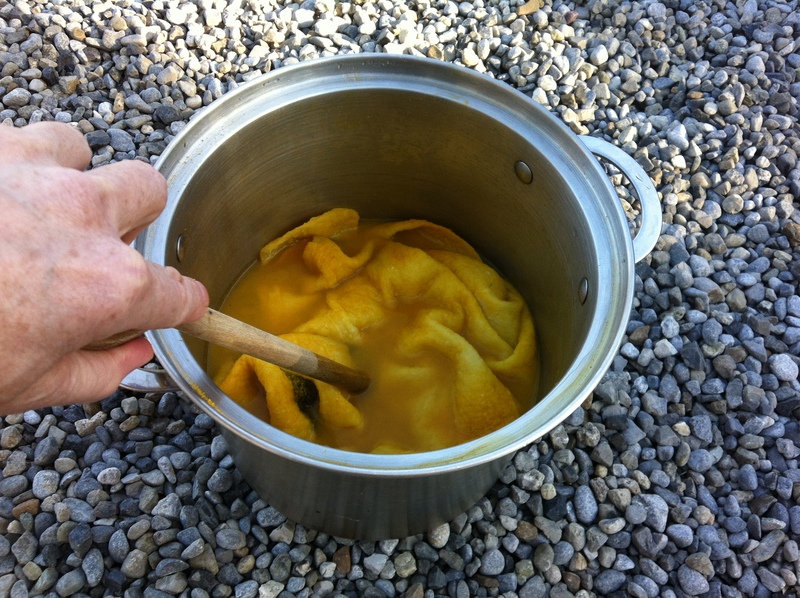 Finally for today, I’m getting a lot of people asking me about the staying power of the turmeric dyeing I did, the answer is that I just don’t know yet! I did research things a bit on the internet first, most people seemed to have no problems and I’m hoping that the vinegar I added as a mordant will be sufficient to help the colour remain fast. If not however, I’ll just re-dip again to bring back that lovely rich yellow! 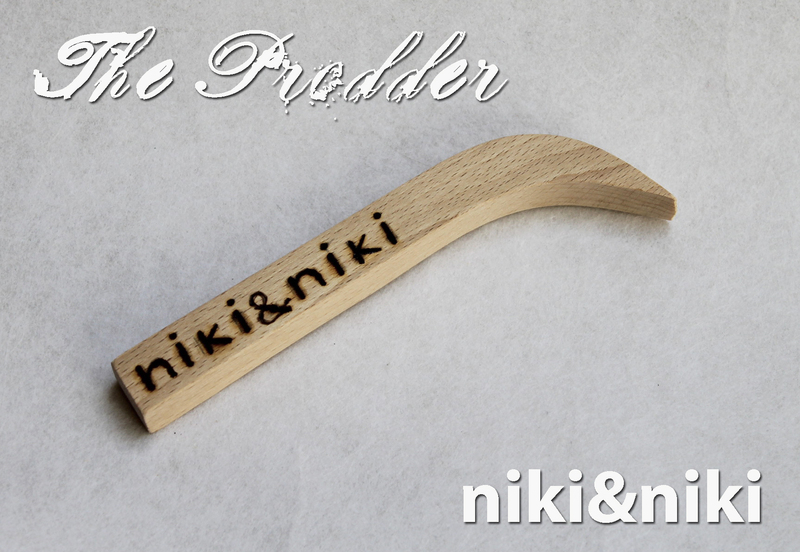 Our ‘niki & niki’ felting tools are branded now and ready to go out in the post on Monday!!! I’m thrilled with the new brand logo that Niki Collier has been painstakingly marking on all our new felting tools, tomorrow I’m going to post properly about them and share our final names but for now here’s a pic!!! They’ll be ready to go out in the post on Monday to those of you who have placed your orders already, we’ll just invoice you via PayPal over the weekend and send them as soon as we have addresses and know that the payment has gone through. Have a great weekend everybody! 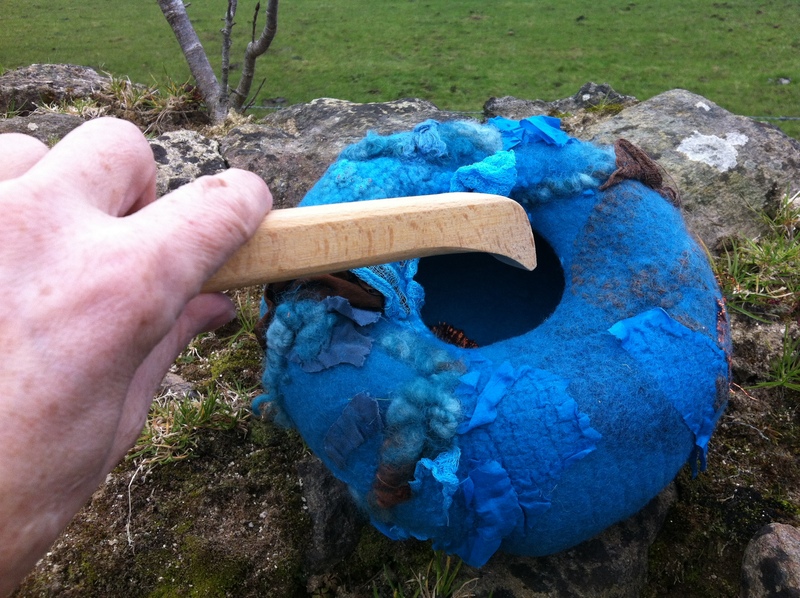 Small vessels, sculptures and bags will need 80 – 150g of fibre. Larger and more complex vessels, sculptures and bags will need 200 – 350g fibre, for bags I like this to be divided into 2/3 merino and 1/3 a strong coarser fibre such as C1 or Icelandic wool. A simple textured nuno scarf will need either a pre rolled silk chiffon or ponge silk scarf as a base, a long length of silk cut from a roll or alternatively a cotton cheesecloth or muslin length, the longer the better in all cases! This project won’t need anything like a big amount of fibre but at a rough guide anything between 40 – 60g will be fine for a highly textured end result! A large textured nuno wrap/bolero (two day project!) will need 2 – 3 m (yards is fine) silk chiffon, ponge silk, cheesecloth or muslin for the base and at least 40 – 100g good quality merino depending on size. A large collaged nuno wrap, wall hanging or yardage for clothing (this may be made using the tumbler method and if so requires no rolling!) will need a piece of base fabric approx 35 to 40% bigger than the desired finished size. I like to use muslin, cheese cloth or my favourite cotton gauze for this but you can use silk chiffon or ponge silk too! In addition to this base fabric you need at least the same volume of fabric in a selection of colours and mixture of weights and texture, i.e. if your base fabric measures 180cm X 40cm you need about 2m X 50cm fabric comprising a mixture of silks, cottons and/or some metallic mesh plus at least 200g good quality merino (for wearables) or alpaca/other fibre for a wall hanging. A large table runner will need less fabric than the large collaged nuno wrap above but a higher percentage of wool to fabric, this it to make sure that the runner will actually protect the table from heat or water and is not just decorative, decorative’s OK too if that’s what participants want! As you can imagine different projects require different techniques and heaviness of hand when laying out the fibre. For wearables I usually but not exclusively use merino with some surface silk/banana/tencel/firestar fibre so I would just encourage particiapnts to sort through their stash and we’ll work together with whatever they bring. The figures above are a minimum guideline, I don’t want anyone to feel pressurised to buy more fabric or fibre than they may realistically need but to be honest where felting is concerned, can one ever have enough fibre or raw materials??? 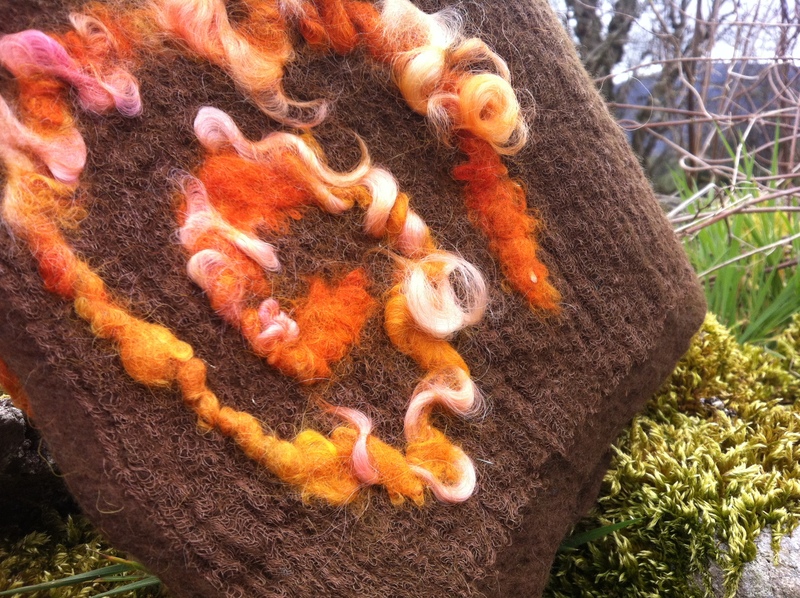 Each participant will also need to bring their usual felting equipment to the workshop. This may include bubble wrap, towels (please bring a few! ), hard olive oil/goats milk/glycerine soap, sprinkler, bamboo blind, pool noodle, net, whatever they like to work with themselves, people wishing to try the tumble dryer method need to bring an additional lightweight roll of builders plastic to use instead of bubble wrap. 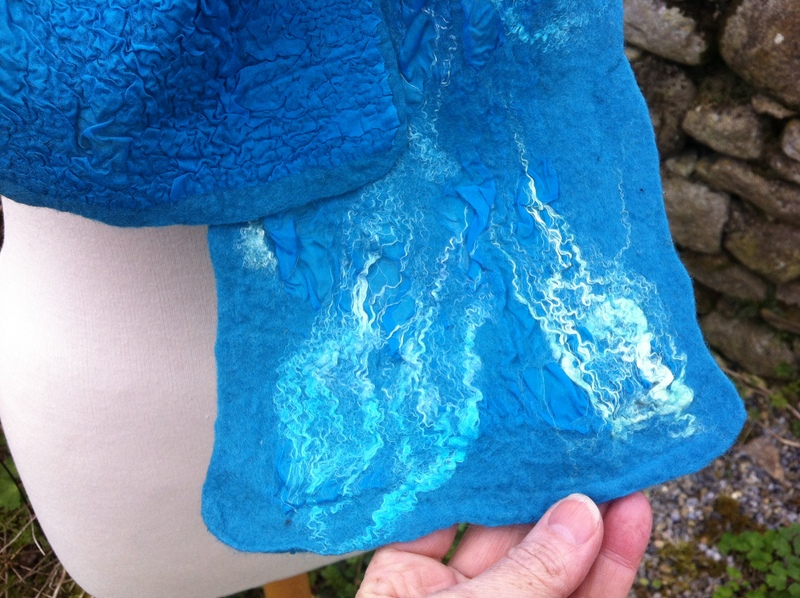 Anyone felting a bag, vessel or any sort of three dimensional project will need some flexible plastic to use as a template/resist, I prefer 2 or 3mm laminate floor underlay but in an emergency we can use bubble wrap or whatever flexible plastic you have to hand. NB I love working with batts but roving and tops are perfect too, bring whatever you have and like to work with yourself. I will also be bringing loads of embellishing goodies with me for everyone to share! 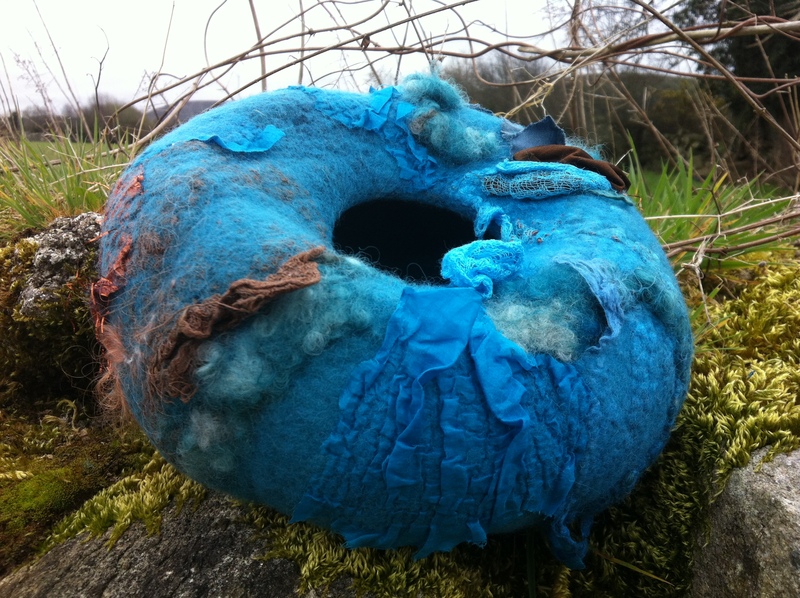 Now for some pictures and chat about the pieces I was nuno felting yesterday. Those of you following me on Facebook (click both links on the sidebar to the right if you’ve not already done so!) may have seen the image I uploaded yesterday morning showing some chocolate merino, gauze and beautiful hand spun yarn from my great buddy Heather which I gathered together and was in the process of felting into a simple nuno scarf. This is one of the projects I’ve been completing for the new book with Chrissie, basically it’s an easy first piece for anyone to try using the tumble dryer method. 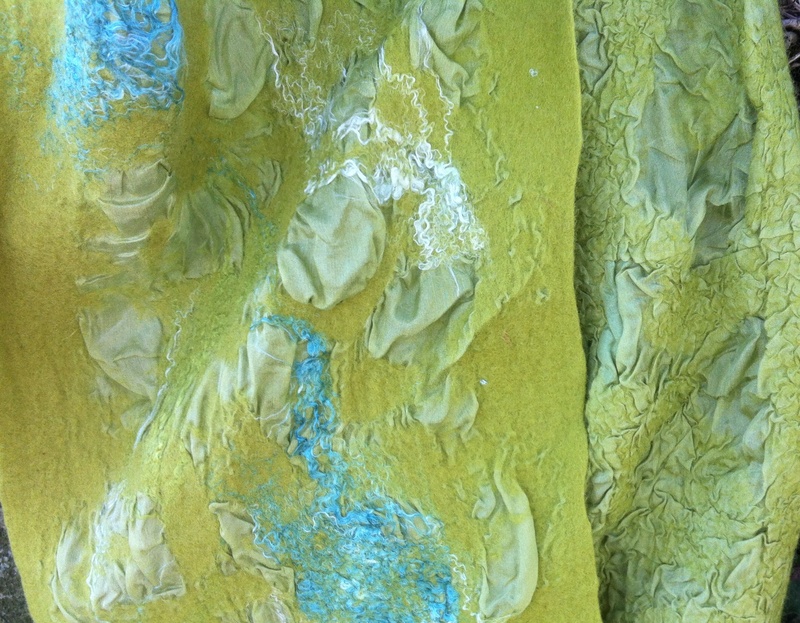 The image here shows how this particular hand spun felted beautifully to the surface of the gauze, I love the texture and colour of it on the surface of this scarf, it’s well felted together but you still have amazing texture from the slubby yarn! Pictures of the completed scarf will be revealed when the book is finished, hopefully not too long because I’m working on it every day now and hope it will be finished before Dawn arrives for her holiday and workshops here at Clasheen in April!!! The other scarf that I felted yesterday (I also started some felt landscapes) is an even simpler piece, one fine open layer of short fibre merino on top of a long piece of ponge silk. 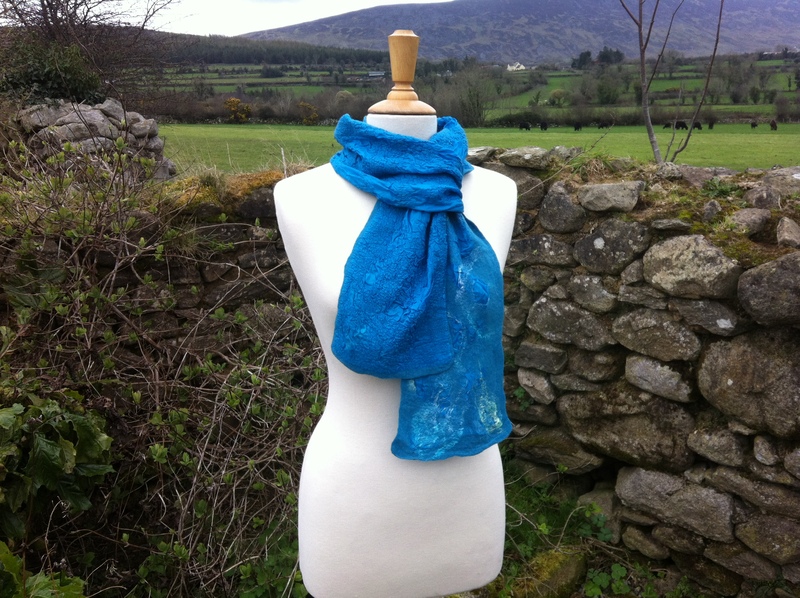 I also added a lot of hand dyed silk fibre on top of the merino, I like the way this scarf can be reversible and only wish that it had been less windy when I was trying to take pictures of it this morning!